A Chef of Your Own cooked for a beautiful outdoor wedding in a Jeeves Managed home last night. I carved the melon with the bride and grooms initials. 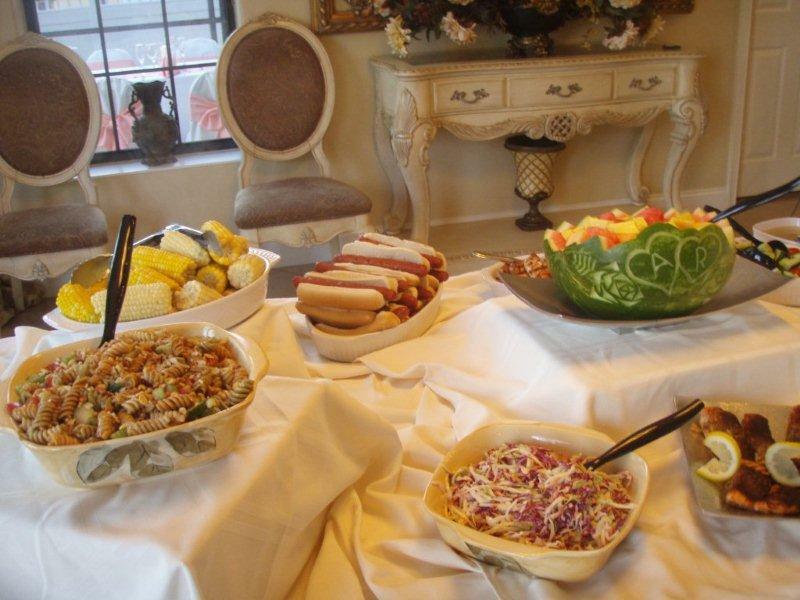 The menu was BBQ, pulled pork, cole slaw, pasta salad, BBQ Roast Salmon, Grilled Chicken fingers and Chocolate Swirl Cheesecake with fresh whipped cream and strawberry sauce. Another great demo at The Fresh Market this week. Now for a cookie contest. Leave me a comment here and I will randomly select a winner of the dozen cookies first thing Friday morning. 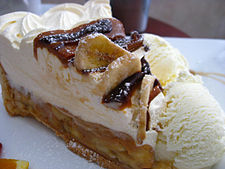 That’s what I said when a recent A Chef of Your Own client asked for Banoffee Pie for dessert. It is another dessert from across the pond, England. Being the trooper I am, I went to the internet and looked it up. There really are a lot of really good sites out there to get recipes. This one came off of Paula Deen’s page. I didn’t want to mess with making the toffee so I cheated and used a quality Dulce de Leche I found at the store. 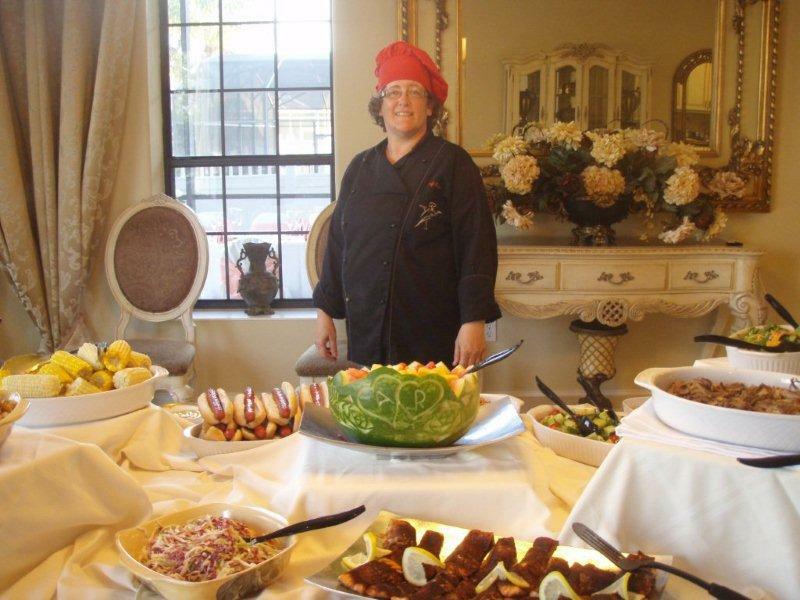 The guests couldn’t believe I had never made it before and it was the hit of the meal. I thought it was pretty good as did the rest of us that got to taste the leftover piece. Thank you Wayne and Dani, I wish you many happy returns. Warm Dulce de Leche gently in a warm water bath. Pour into bowl and add sliced bananas. Toss gently to coat. Spoon mixture into graham crust, cool in refrigerator ½ hour. Top with whipped cream and serve. I served it with peanut butter ice cream. Here is a Chef of Your Own recipe I have adapted from Cooking light magazine. When I make meatloaf for my clients, I freeze it raw so when they bake it off it is a freshly baked item. I hope you enjoy this as much as my guests. Preheat oven to 400 degrees. Spray 9x5x3 inch loaf pan. In a large mixing bowl, combine all ingredients. Transfer to loaf pan and press into place. Bake for 50 minutes to one hour, or until cooked to 160 degrees and juices run clear. This recipe is for a good friend and client who has asked for it for her birthday. I wish you many happy returns. I got this from allrecipes.com, a favorite site of mine to get recipes. Cream butter in a mixing bowl. Gradually beat in the sugar with a mixer until light and well blended. Stir in the thoroughly cooled chocolate, add the vanilla. Add the eggs, one at a time, beating 5 minutes on medium speed after each addition. Pour into pie shell. Refrigerate 2 hours before serving. Today is a first for the demo’s at The Fresh Market. A Chef of Your own will be preparing a vegetarian entrée. Please stop by at the Fresh Market in Dr Phillips if you get the chance, today, April 9th from 3-6. Hope you enjoy this. Here is a link to a video to see it prepared, http://www.chefsusa.com/freshmarket/tfm_nicoise_salad_meatballs_04_11.wmv Here is the recipe for Mediterranean “Meat” Balls. meatballs to pan and cook in sauce for 5 minutes, or until cooked through. Serve with fresh mint and feta sprinkled on top. This is A Chef of Your Own recipe I have made for many clients. It is a vegetarian entrée, you can add tofu crumbles or ground beef if you like. Cook the noodles according to the package directions. Drain and set aside. Filling: Beat cream cheese until smooth, stir in the spinach, 1 cup os the parm cheese, ricotta cheese, mozzarella cheese, Italian seasoning and salt. Pour enough sauce in the pan to cover the bottom. Cutting each lasagna roll in half (crosswise) place them in the sauce, cut side down. After placing all the rolls in the pan, top with the remaining sauce and parmesan cheese. Bake in preheated 350 degree oven 30-40 minutes or until hot throughout.